What’s a spiedie? 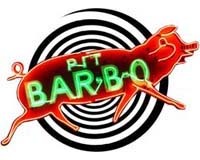 If you’re from the Binghamton-Endicott-Vestal vicinity of Upstate New York, it’s likely the sandwich you most miss from back home. “Cubes of meat marinated in cider vinegar, oil and herbs. We use Lupo’s, a marinade made in Endicott. Ship it down here by the pallet.” That’s Shawn Dobozin, a chef and recent transplant from Vestal to the Queen City. This summer he and his uncle Rick Thomas launched a Charlotte food truck called WhatzaSpiedie. Choose chicken or pork, which arrives hot, herb-flecked and tangy with vinegar. Ask for it nestled into a soft hoagie roll or arrayed on a simple slice of Italian bread. The marinade marries with the bread, a comforting counterpoint to the meat. It’s great with a beer — though non-beer folks like me will enjoy it, too. No one is sure but the name spiedie might come from the Italian word spiedino, for skewer. “An Italian guy in Endicott started selling them at the train station” back in the ‘thirties, says Thomas. “Lots of people from Upstate New York live around Charlotte. They started coming down with IBM in the late 1970s,” Dobozin adds. Thomas knows that first-hand. IBM transferred his wife from the computer giant’s hub in Binghamton to the UNC Charlotte Research Park nearly forty years ago. 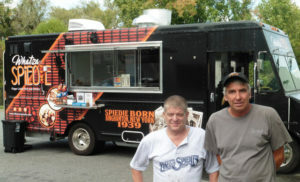 After careers in other fields, Dobozin and Thomas hatched the spiedie truck idea over beers on the patio one evening. You can often find WhatzaSpiedie at 26 Acres Brewing, a newly opened brewery tucked into the back of a NASCAR-themed business park near Concord Mills Mall. Or track it elsewhere via Facebook. 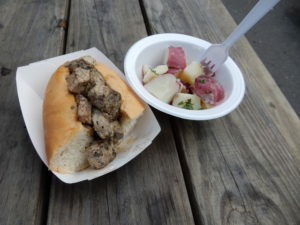 Charlotteans seem to like spiedies. “Some ask for toppings,” Dobozin says. “No toppings, that’s how the original spiedies were served.” Dobozin is willing to innovate, though. He’s worked up a spiedie in a tortilla wrapper instead of bread. He’s created spiedie-flavored rice as a side dish, an alternative to the traditional salt potatoes. And on the condiment counter, next to the squeeze bottle of Lupo’s, you will find North Carolina’s favorite made-in-Winston-Salem hot sauce, Texas Pete.